Jharol and Laiba, two former Leaders students who are now attending Queens College and John Jay College of Criminal Justice, respectively, are taking the helm of our new Crew Mentors pilot this year. Trained to be peer mentors by our Alumni Manager and the College Access: Research and Action (CARA), they are providing peer support to other NYC Outward Bound Schools alumni who are current college freshman. Jharol and Laiba are particularly well-equipped for this position: as NYC Outward Bound Schools alumni themselves, and former College Crew members, they have experienced first-hand both the challenges of making it through the first year of college, and the value peer support can play in navigating those challenges. 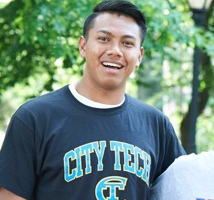 Jharol is mentoring a Crew of NYC Outward Bound Schools alumni who are attending City Tech, which he himself attended for his first two years of college. Laiba is leading a Crew of Leaders High School alumni, who are enrolled at a variety of different colleges. In both cases, their aim is to provide one-on-one support to their mentees through text, phone, and in-person meetings, and also help coordinate and lead gatherings for their respective Crews. In their first month as Crew Mentors, Jharol and Laiba have been focused on getting to know each of their mentees and making sure they get off to a strong start in college. Their mentees were identified for the pilot program by their high school College Counselors. They were targeted because they were at particularly high risk of dropping out of college, perhaps because of tenuous financial aid packages, or because they have a history of struggling academically. Jharol and Laiba use the text messaging service we use for Text-to-Success, to connect regularly with their Mentees. Already, they are getting some positive feedback from Mentees and through one-on-one conversations have helped several students navigate challenges they’ve run into during their first weeks of college. One of the most surprising trends they’ve found is that students aren’t always aware of all the opportunities available at their school. For example, if they’re juggling a job and school, Jharol and Laiba coach them to explore work study as an alternative. 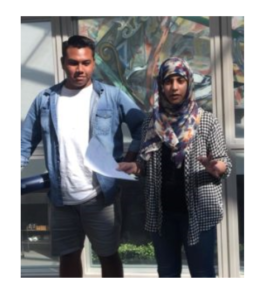 “[Work study] is more flexible, they’ll work with your class schedule,” Laiba explains. Jharol and Laiba are also working on building relationships at the colleges where their Mentees are students. They know that if they have a good relationship with people in the Welcome Office or Employment Office, they’ll be even more valuable to their Mentees. The first month of the pilot has been an eye-opening experience and the early response from students has already inspired Jharol and Laiba to continue outreach and make sure their Mentees are taking advantage of all their campus and community has to offer. Read about the first semester of Crew Mentors and learn Laiba and Jharol’s greatest takeaways.